graff/it/i is about mapping and retracing the city’s process of graffiti removal. The project took the form of a web app. 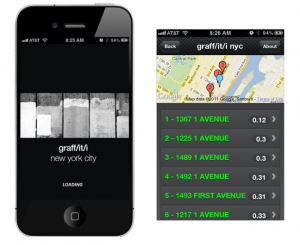 graff/it/i maps walking routes out of the city’s open data of graffiti removal locations. These walking routes are mapped out by the date of removal, giving the urban explorer/researcher a trace by which to evaluate the efficacy of graffiti removal as a quality of life issue. The project also involved visualizing the graffiti logged and removed from New York City streets. 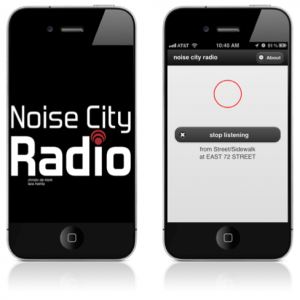 Noise City Radio is about tuning into and experiencing the agitated public sphere. The project is a web app that combines the user’s geolocation with the city’s open data of noise complaints. The user experiences the 191 thousand complaints and 30+ noise complaint categories as little pirate radio’s broadcasting the noise as they walk through the city.